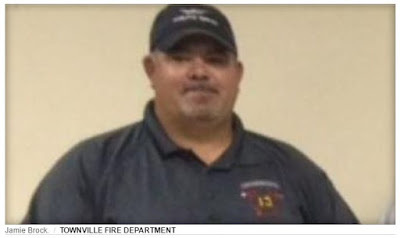 TOWNVILLE, S.C. -- A volunteer firefighter tackled a teen suspect in a shooting at a South Carolina elementary school Wednesday, keeping him on the ground until law enforcement could take him into custody, a fire chief said Thursday. Giving an emotional statement to reporters, Townville Fire Chief Billy McAdams said volunteer firefighter Jamie Brock was able to subdue the shooter while McAdams was inside tending to a critically wounded 6-year-old boy. The shooting began Wednesday afternoon in a rural area of Townville near the Georgia-South Carolina line. Authorities say the teenager killed his father, 47-year-old Jeffrey Osborne, and then drove to Townville Elementary School, about two miles away. The teen crashed his pickup truck into the playground fence before opening fire and wounding a teacher and two students as they left the building for recess, Anderson County District 4 Superintendent Joanne Avery posted online Thursday. She said the shooter never entered the school. "911 dispatchers received the initial call around 1:45 p.m. from a teacher who was in a classroom, reporting an armed male on the campus, officials said at a press conference Wednesday evening. The shooting left a 6-year-old boy in critical condition and undergoing surgery, Scott Stoller, Anderson County’s director of emergency services, told the Anderson Independent Mail. The other boy and a female teacher were in good condition, said Juana Slade, spokeswoman for AnMed Health Medical Center. Both boys were 6 years old, the Independent Mail reported. Teachers then led the students to safety inside. McAdams gave a harrowing account of the moments after officials received a 911 call at 1:45 p.m. from a teacher in a Townville Elementary classroom, reporting the gunman on school grounds. McAdams said he called the school’s front office to confirm the report, and then he and Brock rushed to the scene from his nearby farm. He said he learned from a front office receptionist that the shooter and the wounded were in the back of the school near the playground, so he and Brock pulled into the school’s rear parking lot. McAdams said they immediately noticed a black pickup truck that was crashed into the playground area. Once they checked inside the truck and found no one inside, the two heard teachers asking for help for wounded students inside. That’s when the two decided to split up, McAdams said. Brock suggested McAdams, a paramedic, go inside to offer medical assistance, while Brock continued to search for the gunman. Inside the school, McAdams said he encountered Meghan Hollingsworth, a teacher who had been shot in the shoulder, but she refused treatment and directed him to the most seriously wounded student – 6-year-old Jacob Hall, who had been shot in the leg. “She was telling us to take care of Jacob and not to worry about her,” McAdams said. Hollingsworth, McAdams said, was one of the teachers who had earlier helped usher students to safety despite her injuries. McAdams said he and a school nurse tended to the boy until other agencies arrived to assist them, and the child was transported via LifeFlight to a pediatric trauma center. Hollingsworth and another 6-year-old boy, who had been shot in the foot, were transported via ambulance to a hospital. Around the same time, unbeknownst to McAdams, he said Brock had encountered the gunman near a rear corner of the school. “He felt it was imperative to the safety of the students, the teachers, and all the responders onsite – he immediately confronted and subdued that shooter and was able to keep him on the ground until law enforcement placed him into custody,” McAdams said. Anderson County Sheriff John Skipper said earlier that Brock, a 30-year veteran of the Townville Volunteer Fire Department, “just took him down” and stopped the teen before he could get inside the school. Brock “wants to remain humble and quiet about it” as he believes “he did nothing any of the other volunteer firefighters wouldn’t have done,” Scott Stoller with Anderson County Emergency Management told the Associated Press. Wiping away tears, McAdams said the “devastating” incident has shaken the close-knit community. “We’re gonna feel this for a real long time,” he said. He asked for prayers for Jacob Hall, who remained in critical condition Thursday. Sheriff’s Lt. Sheila Cole said officers and forensic specialists were returning to the school Thursday morning to resume their investigation. Authorities also said audio from the 911 calls made after the shootings will not be released while the investigation is ongoing. 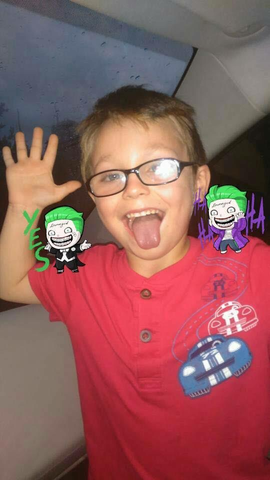 Jacob Hall, 6, has been identified as one of the victims of the Townville, S.C., shooting on Sept. 28, 2016. Anderson County Coroner Greg Shore said the teen, crying and upset, called his grandmother’s cellphone at 1:44 p.m. Wednesday, Anderson County Coroner Greg Shore said. The grandparents couldn’t understand what was going on, so they went to his home just 100 yards away. When they got there, they found Osborne dead and their grandson gone. About one minute later, authorities received a 911 call from a teacher inside the school. Avery said she was “heartbroken about this senseless act of violence” but credited the quick law enforcement response, the brave actions of teachers and staff and frequent school active shooter trainings with preventing more injuries. Television images showed officers swarming the school after the report of an active shooter. Some were on top of the roof while others were walking around the building. Students were driven away on buses accompanied by police officers to a nearby church. Authorities said they don’t yet know a motive for the shooting and they were not sure if the students and teacher were targeted. The sheriff said the teen had been homeschooled. One of the students and the teacher were released from the hospital Wednesday evening, AnMed Health spokeswoman Juana Slade said. The school surrounded by working farms has about 300 students in its pre-kindergarten to sixth-grade classrooms. About 90 percent of the students are white, according to state records. “Our entire family is absolutely shocked and saddened by the senseless actions of our son and grandson. We are praying and will continue to do so for the two precious children who were wounded, and for their courageous teacher who was wounded while rescuing the children. We cannot express the devastation we feel at the loss of our beloved Jeff. Authorities have not released the suspect’s name or age beyond saying he’s a teen. The teacher wounded in the shooting, Meghan Hollingsworth, a first-grade teacher and mother of two who is in her 13th year of teaching, also was reluctant to talk. Both she and the student who was shot in the foot were transported in good condition. “We are not interested in giving interviews or answering questions of any kind,” a sign posted on the front door of her home Thursday morning read. “We ask that you respect our privacy,” the note said, while expressing appreciation for those concerned about her.